This week’s prompt was actually a freebie week! I’ve been considering doing a discussion post about authors I first read through anthologies and wanted more work from, so I thought that would be the perfect topic for this freebie week! Seanan wrote the introductory story for RVF: a genuinely magical story of a robotic theme park, with a twist. It was my first time ever reading anything by her, and it was so utterly clever. I was immediately hooked and have since read all three of her Wayward Children novellas! For RVF, Alyssa Wong wrote a story about a society in which robots fill brothels, mimicking celebrities past and present. It was haunting, gorgeous, and lovable from start to finish, and made me want to pick more up from her. I’m currently reading an anthology she contributed to titled The Devil and the Deep (which also has a Seanan McGuire story!). Sarah’s contribution to RVF was downright creepy: a story about a fairy who becomes obsessed with a little boy, and stalks him into adulthood. It was delightfully morbid and everything I love in dark fae lore. Since then, I’ve picked up her novella River of Teeth, but haven’t had the chance to read it just yet. Carrie’s contribution to Slasher Girls was probably my #1 favorite story: a twisted, bloody Alice retelling that actually had me on edge (which most horror stories never do). I haven’t picked anything else up by her yet, but fully plan to order a copy of The Forest of Hands and Teeth soon! I’d been meaning to check out Julie’s work for years, but I loved her short story about a plus sized, queer matchmaker so damn much, and I can’t wait to pick up Dumplin’ and Puddin’ soon! 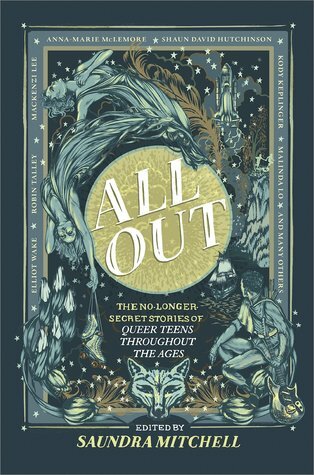 Tess is probably most well-known for the super anticipated Toil & Trouble anthology she helped create, releasing this fall, which I’m so grateful to have an ARC of that I will be reading soon, because her contribution to All Out was unspeakably magical and precious. Do you enjoy anthologies? If so, have you ever found a new favorite author through one? It is really fantastic! I only gave it 3 stars overall because when I averaged it out, there were some that dragged the rating down, but honestly, there are enough stories in it that are AMAZING that it’s 100% worth picking up. Oooh, I am going to add that to my TBR right now – thank you! Nothing wrong with that! ❤ Thanks, I'll check your list out as well! Tess Sharpe is absolutely amazing! I have read Far From You and Barbed Wire Heart and both were so excellent. I really want to read her contributions to All Out and Toil and Trouble. Oooh, awesome! Since you enjoyed her full works too, I’m going to have to check them out! I can’t wait to see what you think of them! I also discovered Julie Murphy through an anthology, but I found her from Meet Cute. I haven’t read any of the anthologies that you’ve discovered authors from, but some of my favourite authors are on your list (Tess Sharpe <3) so I'm going to prioritise trying to get hold of copies. I'm a huge fan of anthologies! My Top Ten Tuesday freebie week topic was recommendations for my daughter, which you can check out here if you’d like to! I really like your topic for this week! I don’t pick up anthologies by various authors very much. Collections I’ve read in the past have all been by the same author, but reading an anthology by several authors would be a great introduction into their work. Here is our Top Ten Tuesday. I always try to seek out other books by anthology authors. I haven’t read many anthologies, but I’m definitely intrigued by a few of these!! I haven’t actually ever read an anthology (have one waiting for me to read), but I love how creative you were with this week’s topic! What anthology is waiting on you, if you don’t mind me asking? I have a couple of anthology ARCs right now that I can’t wait to get to! Because You Love To Hate Me. I meant to read it last year, but never got around to it. Oh cool, I have that one unread on my kindle right now! I’m hoping to get to it maybe this fall when I get into my major anthology mood – I read lots of anthologies in fall and winter for some reason! I haven’t read Dumplin’ yet, but I really liked Ramona Blue! I have that on my wishlist, too! I remember a lot of crap going around about it when it came out because people said it “wasn’t good bi rep” since it included an m/f pairing, which is just biphobic and gross if you ask me. I though Ramona’s journey was beautifully done and it was one of my favorite reads from last year. Aww, I love hearing that! That makes me want to pick it up even more, haha. This is such a unique post idea! I love anthologies and there are many times after finishing an anthology I’ll go through GR and look at the author pages and see what books interest me, but I’ve never thought about discussing it! Really brilliant idea! Thank you so much! 🙂 I’m not sure why the idea struck me but I just had to do it, once it did! I think I just got the first book of that series on ebook recently! Rosemary and Rue, maybe? Bahaha, she really does! She writes SO FAST! 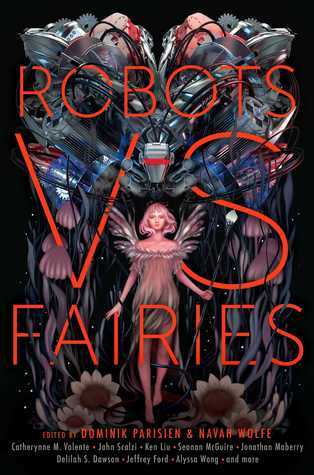 I just learned that Robots vs Fairies existed and now that I know Seanan McGuire has a story in it thanks to you I’m THAT much more exited to read it! I enjoy reading anthologies to discover new authors especially SFF. Nice idea for today’s prompt. I haven’t read any of these but I have heard good things about All Out. I am not a fan of anthologies because I can’t decide how I felt overall. Each story seems to have different impact often. Thank you! That’s understandable about anthologies, though, for sure. I used to struggle big time to review them until I started doing my reviews for them the way I do now, where I split it up per story. Now I give each story its own star rating and average it at the end so that it’s “fair”, because otherwise I struggle to pick a rating! This is a really great topic! You need to submit it so we can all do it! 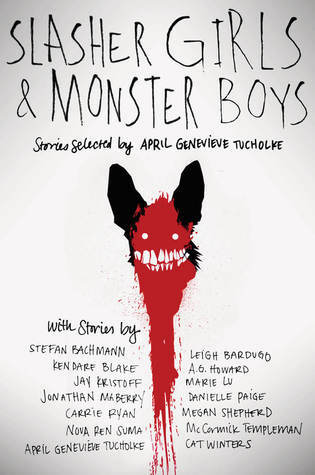 I totally agree about Slasher Girls and Monster Boys! 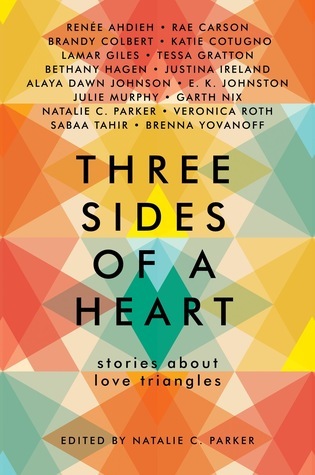 The only anthology I’ve ever tried to read was Because You Love To Hate Me but I have an arc of Fresh Ink I want to read and Hope Nation as well. Awesome post!